Finally, certified copies of Obama’s birth certificate. From BirtherReport March 16, 2015. A constituent received a stunning reply from U.S. Senator Sherrod Brown claiming Obama provided several news organizations with certified copies of his purported original long-form birth certificate, even though the only “news reporter” ever to reportedly touch one of the two purported certified copies was NBC’s Savannah Guthrie. Thank you for getting in touch with me regarding President Obama. President Obama has provided several news organizations with certified copies of his original long-form birth certificate, showing he was born in Honolulu, Hawaii on August 4, 1961. Hawaii became a state in 1959, and all individuals born in Hawaii after its admission are legitimate natural-born United States citizens. 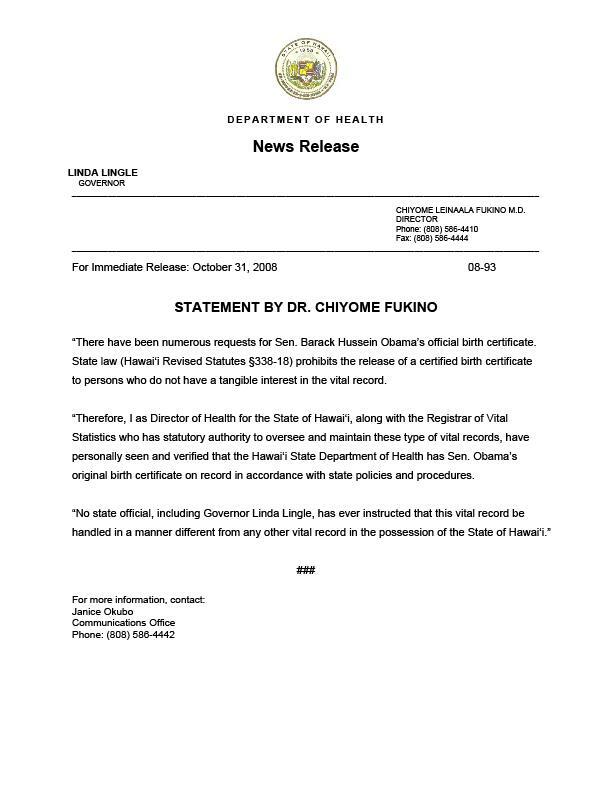 In addition, the Hawaii State Health Department has issued a public statement verifying the authenticity of President Obama’s birth certificate. These lies from Senator Brown are the same ones reported at Citizen Wells on December 30, 2008 in the Hall of Shame. “Thank you for contacting me regarding President-Elect Barack Obama. Every word of your paragraph was wrong!! Obama has provided no one a copy of his birth certificate. eligibility provision of the US Constitution? Being born in Hawaii does not make one a natural born citizen of the US. a child would enable that British child to be president. birth certificate. Read more below. You should have already learned this. If Senator Sherrod Brown knows of the whereabouts of certified copies of Obama’s birth certificate, I would like to see them. Wiretap from Rod Blagojevich trial. The question above, combined with the litany of lies Obama has spoken about his past and his past associations, especially his associations with a multitude of Chicago, IL corruption figures such as Tony Rezko, supercedes all arguments regarding Obama eligibility and fitness for the job of President of the United States. And of course, let’s not forget that Obama is not a natural born citizen. I will revist that later. Let’s revisit some of the lies, ignorance and misstatements of the past associated with officials in the State of Hawaii. “There have been numerous requests for Sen. Barack Hussein Obama’s official birth certificate. State law (Hawai‘i Revised Statutes §338-18) prohibits the release of a certified birth certificate to persons who do not have a tangible interest in the vital record. Governor Linda Lingle was interviewed by Rusty Humphries on December 20, 2008. Lou Dobbs “hits the nail on the head” with these statements. As Dobbs so adroitly states, the COLB presented by the Obama camp is nothing more than a piece of paper that refers to another piece of paper. It is not a legitimate birth certificate and we have no proof that it originated with the Hawaii Health Department. The HI Health Dept. apparently has a birth certificate for Obama, but we have not seen it and Obama has gone to great lengths to keep it and his college records hidden. World Net Daily has presented another interview of Governor Linda Lingle and controversy surrounding Obama’s birth certificate and the state of Hawaii. The disclosure is believed to be the first time a state government official has declared the precise place where Obama was born, despite numerous other published claims, including some for a different hospital in Honolulu. Obama and the State of Hawaii have no credibility. I received the following comment from someone I refer to as a Washington insider. Now, the investigators are searching for a hotel surveillance videotape. While Baker has insisted in the past that “nothing happened” between them, reports reveal that top anti-Obama operatives are offering more than $1 million to witnesses to reveal what they know about the alleged hush-hush affair. This story was covered well by No Quarter back on October 12, 2008. The whispers focus on a young woman who in 2004 was hired to work on his team for his bid to become a senator. The woman was purportedly sidelined from her duties after Senator Obama’s wife, Michelle, became convinced that he had developed a personal friendship with her. The allegations were initially circulated in August, just two weeks before the convention at which Obama finally beat his opponent for the Democratic Party nomination, Hillary Clinton. . . .
“After you read Churcher’s article take a look at today’s piece by Hill Buzz, which carries the nifty title, Who is Vera Baker and Why is She in Martinique? and seems to have similar story line sans the allegations of any romantic entanglements. FEC Senate campaign records show she was paid a pretty penny as “Finance Director”. However, people familiar with Obama’s 2004 Senate campaign say Claire Serdiuk was Obama’s Finance Director. Looking through everything we can see online for that 2004 campaign, Claire Serdiuk is consistently listed as the Finance Director – because that’s what she was. There’s no mention of Vera Baker…but Vera Baker was paid as the “Finance Director” too. The Citizen Wells blog began reporting about Acorn corruption, voter fraud, contributions to mortgage meltdown and strong ties to Barack Obama on August 21, 2008. Since then we have produced numerous articles on Acorn and Obama, in fact, more than enough to prevent Obama from winning the presidency if the public or the MSM had been paying attention. Hat’s off to Michelle Malkin, Larry Johnson and other great journalists who paved the way with extensive research on Acorn and their ties to Obama. During its 15 years in New York City, ACORN has helped squatters claim derelict city-owned property, forced bankers to invest in low-income communities, and organized a war against the city’s workfare program. This comes straight from the Acorn national office. Obama helped Acorn in organizing of “Project VOTE” in 1992. Obama was a community organizer. Obama represented Acorn as attorney, ACORN vs. Edgar. Obama was involved in Acorn leadership training sessions. Obama, Annenberg Challenge, William Ayers, Acorn. Acorn, New party endorsement of Obama. February 25th to May 17th 2008, Obama camp paid $832,598 to Acorn. ““Instead, Democrats like Rep. Barney Frank (D-Mass.) and Reps. Kennedy and Waters allied with the Clinton administration to broaden the acceptability of risky subprime loans throughout the financial system, thus precipitating our current crisis. The Catholic Campaign for Human Development (CCHD) suspended funding for Acorn in October 2008. This is hardly a right wing organization. Where was the media? Where was Congress? We will provide more details about research done for the Catholic Bishops, much of it done and reported by 1997, and certainly mountains of evidence available in 2008. This is criminal that Obama was given a free ride on this by the main stream media and allowed to continue his pattern of lies and deception. That, according to Rep. Kanjorski of Pennsylvania (D); see video below. Please listen to the video closely. Kanjorski states that there was a closed meeting of Congress on about the 15th of September. This would be a MONDAY. Then he lets it slip out that the financial meltdown occurred on a Thursday… of the previous week. It’s been published on other site(s) with my blessing [an email I sent, as below, slightly edited] and I hear it may be on its way to Sen. John McCain. Does he care? Feel free to spread it everywhere, too. I suggest that everyone who cares about America email this information, about the Kanjorski confession — to everyone who has an email address that he has or finds, everywhere in the world. Also, faxed, mailed, and otherwise shoved before the faces of everyone within reach. Or do you want to live on PLANET FASCIST-SOROS, subsector MARXOFASCIST-OBAMA? This is about real treason, real economic terrorism, and real mega-tampering into the sacred process of The Sovereign American Citizens’ national election (getting us our illegitimate “president”). And the government/media cover-up is the second sedition. This is WAR UPON AMERICA, much more threatening than 9/11. This is the email I sent out last night, slightly edited. Congress knows. They all know (or should know) and just enough are cooperating to keep it happening. None of them are telling us — except for one, now. PS: Add to this, the huge, consecutive Friday sell-offs into Wall St., during our pre-election “crisis,” well revealed to America at the time by Mike Huckabee — and the public “slips of the tongue” by apparently subversive Senators Charles Schumer and Harry Reid, contributing to the destruction of IndyMac, by Schumer — said to be the catalyst for the entire mortage meltdown — and in Reid’s case, exacerbating the crisis among critical insurance companies. Does it need to get clearer? If you are not convinced, please stay and do some more reading. The dots connected for you should be enough to relate “probable cause,” fellow Americans.